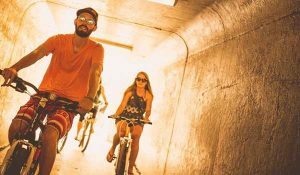 Looking for bike rental in Traverse City? We recommend The River Outfitters as they are TC’s premier bike rental provider. They offer both short & long term rentals including free delivery*. There is NO better way to get around TC in the summer than on a bike! The 27 mile long TART Trail runs all through the city making it a snap to get around. Less traffic, no parking competition and we can conveniently deliver them right you for an overnight, weekend or full week rental. They have a wonderful fleet of bicycles! Including extremely comfortable hybrids, beach cruisers, mountain bikes & kids bikes. Tagalongs and trailers are also available so park that car and get around TC the smart, healthy way. *Free delivery within 10 miles of city limits for weekly rentals, call for pricing if your location is further out 231-833-1413 and tell them Bay Life Getaways sent you!